A man who critically wounded a police officer in the Castro last year was today found guilty of attempted murder and other crimes by a San Francisco jury. Sesar Valadez, a 35-year-old Hayward resident, was found guilty of two counts of attempted murder of a peace officer, two counts of assault on a peace officer with a semi-automatic firearm, and one count each of discharging a firearm from a motor vehicle and discharge of a firearm with gross negligence. He will be sentenced on Jan. 18, 2019. On the night of Oct. 31, 2017, Valadez was seen attempting to break into a vehicle on the east side of Diamond Street. When Officers Samuel Fung and Shawn Kai Hintzen approached the vehicle, three unidentified individuals walked away from the car. Valadez was inside the car and, upon seeing Officers Fung and Hintzen, closed the door and locked himself inside. The suspect refused to answer questions about who the vehicle belonged to or exit the vehicle. He purportedly then suddenly pushed the driver’s side door open, firing two shots at Hintzen’s chest. The bullets did not pierce the officer’s bulletproof vest, but he stumbled and fell to the ground. With the suspect then pointing the gun at him, Fung ducked and ran south on Diamond Street. Valadez chased him and shot at Officer Fung 14 times. Fung emptied his magazine after firing multiple shots at the suspect. He reloaded and fired until seeing Valadez had been wounded after being shot in the right pelvic area. Medical personnel treated the suspect’s wound after responding officers arrested him at the scene. Hintzen was hospitalized for three weeks with bullet wounds to his hand and stomach. He had been caught in the crossfire between Valadez and Fung. 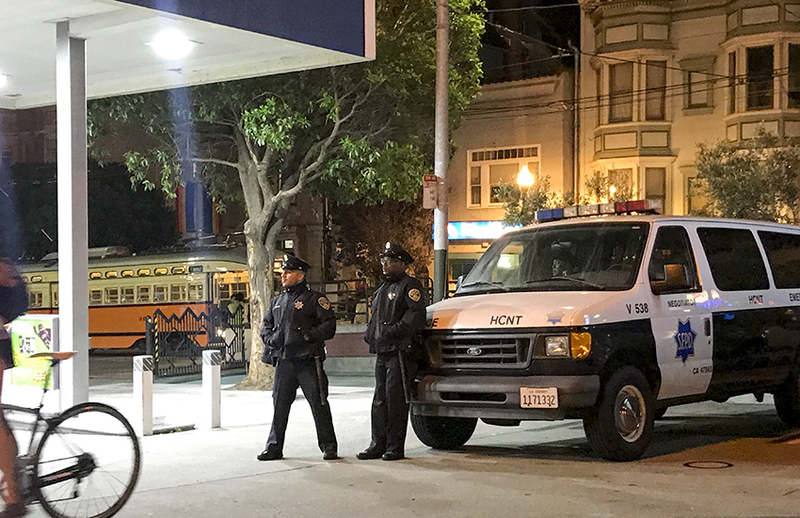 NextSpecial Report: Building the next generation of ‘guardian’ cops — a blueprint for San Francisco?